Burdock (Arctium lappa) is native to Europe and Asia. It was used by India?s traditional Ayurvedics and by the early Chinese for its very valuable health properties. 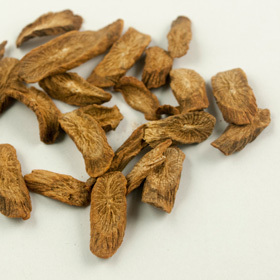 Known as a "blood cleanser," Burdock tea can help detoxify the body. It has a sweet taste and is diuretic. Burdock contains calcium, potassium and iron. Herbalist Micheal Tierra, author of "The Way of Herbs," states that blood purifiers such as burdock, help remove toxins and help the body fight infection. Hardock, Hareburr, Turkey Burrseed, Great Burr, Cocklebur, Beggars Buttons, Cockle Buttons, Lappa, Bardane, Thorny Burr, Fox?s Clote, Love Leaves, Personata, Clotbur, Happy Major.